Ford’s Cobra R was the stripped out racer version of the car only sold to licensed racers. It was the fastest of all the Fox variants thanks in part to its light weight and lack of creature comforts. A 1993 Ford Mustang Cobra R recently crossed the auction block at the Barrett-Jackson Scottsdale auction and set a record becoming the most expensive Fox Body Mustang ever sold. That particular auction was ripe with sweet Ford cars, including a handful of first-generation Ford GT supercars. The Mustang Cobra R that set the record is extremely clean and still wears the plastic on its interior from delivery back in ’93. This particular 1993 Ford Mustang Cobra R was unit number 11 out of the 107 Cobra R models made. Like all Mustangs of the era, the Cobra R hides a 5.0L V8 under its hood that makes 235 horsepower, not much by today’s standards, but in it’s time that was a lot of power. This particular version has a revised camshaft and GT40 cylinder heads from Ford Racing. 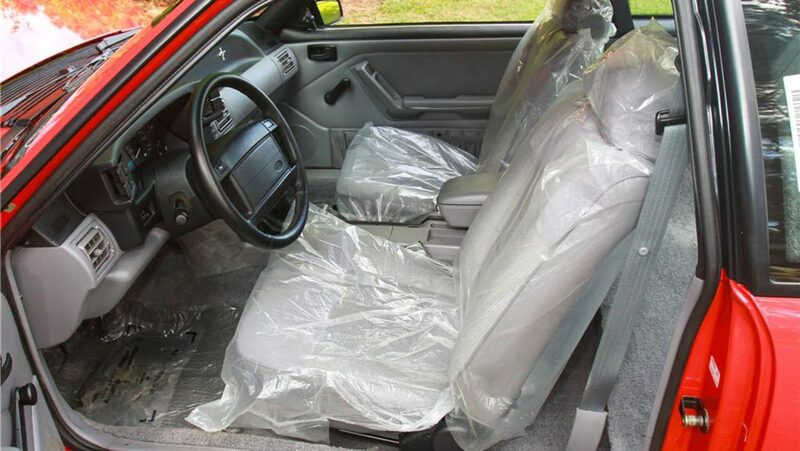 It has only 500-miles on the odometer, meaning someone drove it despite it having the delivery plastic on its seats. Before being sold at the recent Barrett-Jackson Scottsdale auction, the car had only two owners with the first being a Ford dealer in Connecticut and the second Jerry’s Classic Mustangs in Alabama. As clean as the car looks you might think someone spent time washing and polishing for the auction, but the listing claimed the car has never seen water. When the gavel dropped for the last time, this Cobra R sold for $132,000. If you aren’t familiar with the Fox Body Mustang, Regular Car Reviews gave an excellent overview of the car in its video review from 2016. 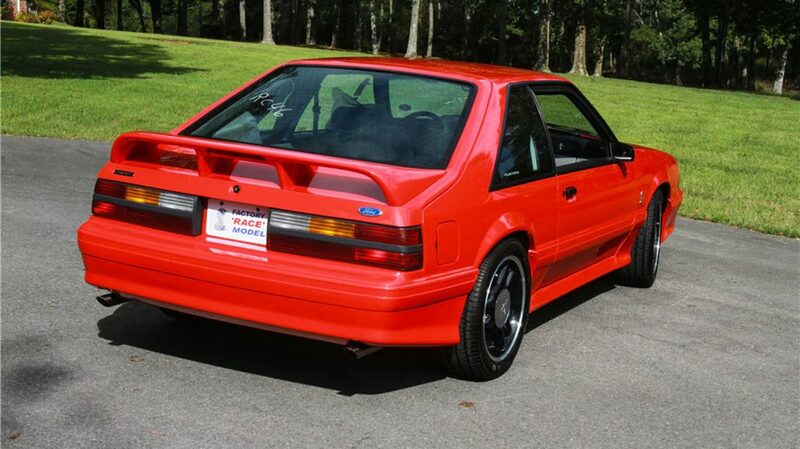 It’s not the most expensive Ford Mustang ever, but it’s certainly the most expensive Fox Body.